Being from the east coast (I'm a born and raised Jersey girl), I often miss heavy rain storms, especially thunderstorms. There's just something so therapeutic about being curled up on the couch with a cozy blanket and hot chocolate while listening to the sound of the pouring rain outside. Although it was no thunderstorm, we finally had some significant rain in L.A. this past Saturday and I loved every second of it. It was all the reason I needed to relax, do laundry and catch up on my favorite shows. Oh I'm so jealous you had rain, I miss it so much! We only get two days of rain a year on average! Looking beautiful as ever! You look so adorable when you wear your Wellingtons i want to hug you. You look so good and happy! I LOVE THE WAY YOU PUT THIS LOOK TOGETHER!!! .... I love thunder storms too!!! i NEVER would have guessed that you are from the east coast! when did you move to LA? i am so intrigued by people who move from the east coast to the west. i lived in nyc (chelsea) for 1.5 years and i LOVED it. I love to see you wearing your Wellies you look really sweet. Such a cute look Audrey! So classic and chic! :) You look incredible! I guess even sunny L.A. weather can get boring after a while... Extremes are just no fun - I have the cuddle up options every single weekend! All is well:) Hope with you, too! lol. I don't miss rain at all. But then again, we get plenty of it in Seattle. Cool boots. This outfit is exactly what I'd wear. 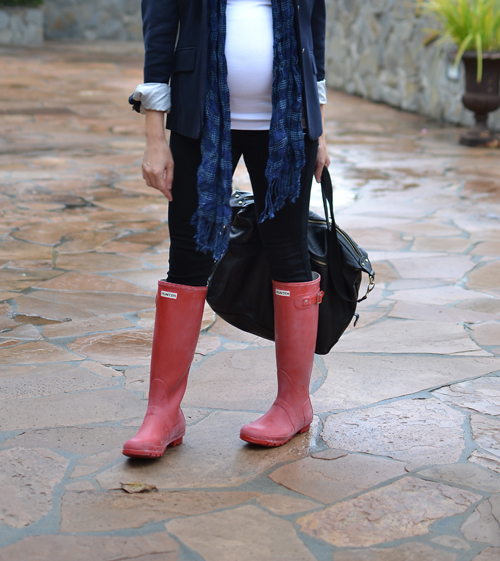 I have to say that I have seen MANY a blog post featuring Hunter rain boots but yours is the first where the boots actually looks used. Bravo!!! !